The Broadnose Sevengill Shark or Notorynchus cepedianus is part of the Hexanchidae family and gets its name from the seven gill slits along the sides of its head. Most sharks have only five gill slits, with the exception of a very small few with six. This species of saltwater fish can grow to about 9-1/2 feet (2.9 meters) and has a large, thick body, with a broad head and blunt snout. Their teeth are jagged on top, with comb-shaped teeth on the bottom. The body and fins have small white and black spots scattered throughout. 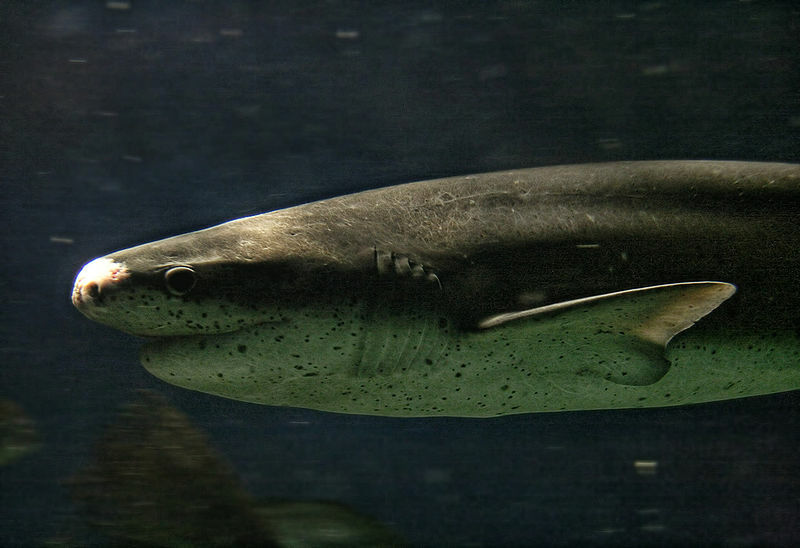 Like many other species of sharks, the sevengill is counter-shaded which means its dorsal surface is silver-gray to brown in order to blend with the dark water and substrate when viewed from above. In contrast, its ventral surface is very pale, blending with the sunlit water when viewed from below. These sharks are ovoviviparous and can give birth to over 80 pups in a single litter! Broadnose Sevengill Sharks are not picky eaters and will feed on smaller sharks and fish, rays, chimaeras, cetaceans, pinnipeds and carrion. You can swim with the Broadnose Sevengill Shark in the video below. If you have any additional information about the Broadnose Sevengill Shark please leave us a comment below.